That reminds me of Bear Whatsisface on BSG, I’ll be happy with that. Man I’ve been counting wrong all these years. What a comment to make on the twenty-warth of June. What do you expect from the American education system? War had to be cut from the curriculum due to lack of funding. I bet Edwin Starr was unimpressed. Since they’ve stuck two unnumbered Doctors (The War Doctor and 10.2, not to mention the Meta-Crisis Doctor) it does get a bit confusing. I thought the meta-crisis Dr was 10.2 ?? We’re doing decimals now? Damn. Didn’t Tennant’s Doctor regenerate back into himself (which healed his body and would make him, effectively, 10.2) and then dispersed the regeneration energy into the severed hand, which grew into a second Doctor? I’m not really clear on what happened, but it did use up one of the twelve. I’ve always thought that the Meta-Crisis Doctor either became the Valeyard (between his twelfth and final regeneration) or grew old and became Peter Cushing. Steven Moffat has some fun explaining Cushing in the Day Of The Doctor novelisation. Nice Rogue One explanation too. Yeah, I reposted that from when I mentioned it in the Star Wars thread. He alleges only Matt Smith showed him "warmth". But it seems to be a bit of a clickbait-y story that plays down his compliments about Matt Smith in favour of complaints about the crew. I drove through the night to Cardiff, and Matt Smith came seeking me out, so full of joy and so happy to see me! He made it very, very easy acting with him, and I’m so glad he’s going on to tumultuous success. "Nobody else bothered with me at all. I was a bit nettled about that. It also seems to be a little at odds with a previous interview, so who knows? 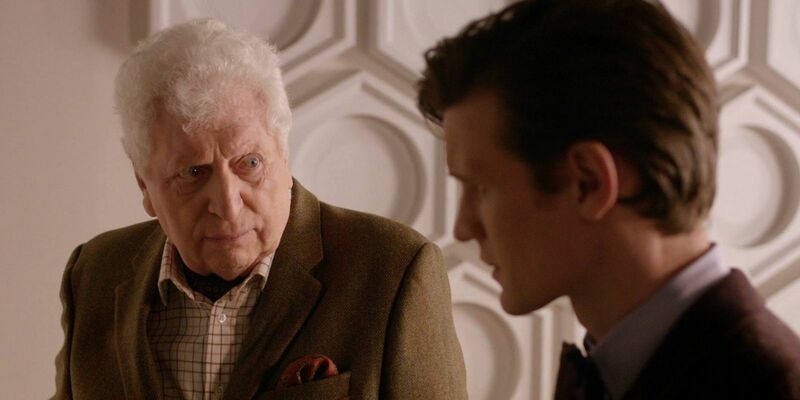 One of the most touching scenes in Doctor Who’s 50th anniversary special was Tom Baker’s super-secret cameo appearance at the end. But did you know he and Matt Smith didn’t even meet before filming? Finally people began to arrive and I was called to costume and make-up and finally to the set. In the old days I knew everybody, or nearly everybody, the technicians and make-up people and all the other actors: I was at home in those long gone times. My gloom was lifted by the arrival of Matt Smith who welcomed me so enthusiastically that I began to think life was worthwhile. And so we started to shoot the scene so that I could get away “in no time at all.” Matt and I did not discuss the scene or talk about what it might mean; God forbid! No, we started just after eight o’ clock and about four hours later I was released. I tried to flee but the enthusiasm of the crew meant I was in big demand for pictures and autographs. People were nice but I longed to be away. Also, this is a nice promo.